Introduction: Generally, hypoxia at less than 10,000 ft (3,048 m) has no apparent effect on aircrews. Nevertheless, several hypoxic incidents have been reported in flights below 10,000 ft. A recently introduced pulse oximeter using finger probes allows accurate monitoring of oxygen saturation (SPO 2 ) in the aeromedical environment. Using such a pulse oximeter, inflight SPO 2 levels were evaluated in aircrew in unpressurized aircraft. In addition, career in- flight hypoxic experiences were surveyed. Methods: In-fl ight SPO 2 was measured in aircrews operating UH-60J helicopters at up to 13,000 ft, and 338 aircrew members operating unpressurized cabin aircraft were surveyed concerning possible in-fl ight hypoxic experiences. Results: In aircrews operating UH-60J helicopters, SPO 2 decreased significantly at altitudes over 5,000 ft, most markedly at 13,000 ft (vs. ground level). The survey identified three aircrew members with experiences suggesting hypoxemia at below 5,000 ft. Conclusions: Careful attention should be paid to the possibility of hypoxia in aircrews operating unpressurized cabin aircraft. 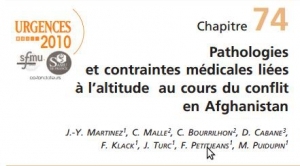 Si l'intervention dans de telles conditions nécessite évidemment une pratique réelle de la montagne en haute altitude, la spécificité de la pathologie médicale rencontrée semble être essentiellement en rapport avec l'isolement. As the highest peak on the planet, Mount Everest provides a truly austere environment in which to practice medicine. We examined records of all visits to the Everest Base Camp Medical Clinic (Everest ER) to characterize the medical problems that occur in these patients. A retrospective analysis of medical records from the first 10 years of operation (2003–2012) was performed. Descriptive data collected included patient demographics, diagnoses, treatments, prescriptions, medications dispensed, and evacuation type, if any. Results: In all, 2941 patients were seen for a total of 3569 diagnoses. The number of patient visits each year at the Everest ER increased at a greater rate than the total numbers of climbers attempting Mount Everest over this period. The most commonly treated patients were Nepalese, accounting for 51% of all nationalities. The most common medical diagnoses were from pulmonary causes such as high altitude cough and upper respiratory infections, comprising more than 38% of all medical diagnoses. The most common traumatic diagnoses were from dermatologic causes such as frostbite and lacerations, comprising 56% of all traumatic diagnoses. Pulmonary and dermatologic diagnoses were also the most frequent reasons for evacuation from Everest Base Camp, most commonly for high altitude pulmonary edema and frostbite, respectively. Medical professionals treating patients at extreme altitude should have a broad scope of practice and should be well prepared to deal with serious traumas from falls, cold exposure injuries, and altitude illness. Singh GK et All. Indian J Dermatol. 2013 Mar-Apr; 58(2): 107–112. Low humidity, high-velocity wind, excessive ultraviolet (UV) exposure, and extreme cold temperature are the main causes of various types of environmental dermatoses in high altitudes. A retrospective study was carried out in patients visiting the lone dermatology department in Ladakh between July 2009 and June 2010. The aim was to identify the common environmental dermatoses in high altitudes so that they can be treated easily or prevented. The patients were divided into three demographic groups, namely, lowlanders, Ladakhis (native highlanders), and tourists. Data was analyzed in a tabulated fashion. A total of 1,567 patients with skin ailments were seen, of whom 965 were lowlanders, 512 native Ladakhis, and 90 were tourists. The skin disorders due to UV rays, dry skin, and papular urticaria were common among all groups. The frequency of melasma (n = 42; 49.4%), chronic actinic dermatitis (CAD) (n = 18; 81.81% of total CAD cases), and actinic cheilitis (n = 3; 100%) was much higher among the native Ladakhis. The frequency of cold-related injuries was much lesser among Ladakhis (n = 1; 1.19%) than lowlanders (n = 70; 83.33%) and tourists (n = 13; 15.47%) (P < 0.05). Dryness of skin, tanning, acute or chronic sunburn, polymorphic light reaction, CAD, insect bite reactions, chilblain, and frostbite are common environmental dermatoses of high altitudes. Avoidance of frequent application of soap, application of adequate and suitable emollient, use of effective sunscreen, and wearing of protective clothing are important guidelines for skin care in this region. 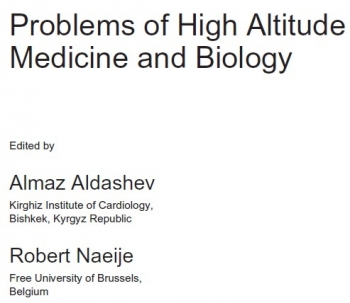 To provide guidance to clinicians about best practices, the Wilderness Medical Society (WMS) convened an expert panel to develop evidence-based guidelines for the prevention and treatment of acute mountain sickness (AMS), high altitude cerebral edema (HACE), and high altitude pulmonary edema (HAPE). These guidelines present the main prophylactic and therapeutic modalities for each disorder and provide recommendations for their roles in disease management. Recommendations are graded based on the quality of supporting evidence and balance between the benefits and risks/burdens according to criteria put forth by the American College of Chest Physicians. The guidelines also provide suggested approaches to the prevention and management of each disorder that incorporate these recommendations.